3Doodler. The 3D printing pen. The world’s first handheld 3D printer. 3Doodler is a brand new way of creating 3D objects. The 3D printing pen uses 3mm ABS plastic or PLA bioplastic as its "ink", just like a 3D printer. As you draw with it on any surface and lift it up into the air, it extrudes heated plastic, which is quickly cooled by an integrated fan, and solidifies into a strong stable structure. This allows users to easily build an infinite variety of 3D shapes and models, jewellery, decorative art, and personalize items such as iPhone cases, laptops, pens, etc. It can even be used for minor repair work. It’s compact and easy to use, and obviously requires no software or computers. You just plug it into a power socket and can start drawing anything within minutes. You will instantly be able to trace objects on paper, and after only a few hours of practice you will be able to make far more intricate objects. Designs can be created as flat forms and peeled off a piece of paper, as freestyle 3D objects, or in separate parts, ready to be joined together using the 3Doodler. 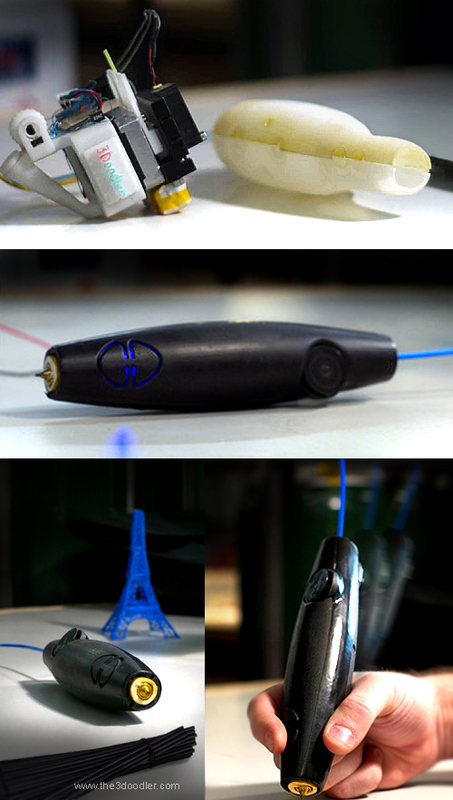 3Doodler is actually nearing production; final version is expected to be delivered by January 2014. (a crowdsourced funding platform for creative projects).